This keto iced coffee recipe is delicious and easy to make! If you know me, then you know that iced coffee is my weakness. I have it almost every day, even during the colder months of the year. However, since I’ve been following a Ketogenic diet for the past 6 weeks, I have had to adapt my iced coffee drink and recipe to better fit my new lifestyle. I’ll have a more in-depth post ALL about the Ketogenic diet, but for now I wanted to quickly share my Keto Iced Coffee Recipe. What’s great about this recipe is that it’s so easy to make and will satisfy your fancy coffee cravings! If you follow a low carb high fat diet, like the Keto Diet, you will learn that a lot of your old eating habits have to change in order for it to be successful. To stick to this diet long-term, one thing I learned quickly was how to adapt my usual iced coffee recipe to make it keto-friendly. I wanted it to taste just as good as what I was drinking before, so it was important for me to do some research on what exact was Keto-friendly when it comes to coffee drinks. There are so many things that can kick you out of ketosis. Syrups, dairy and non-dairy products, and any additional ingredients have to be modified because of the higher carb count. There are so many ways you can make iced coffee at home that is keto-friendly. You can brew the coffee overnight, used leftover coffee in ice cube trays for a more concentrated drink, try it with various milk options (plant-based or not), or just have it plain black. 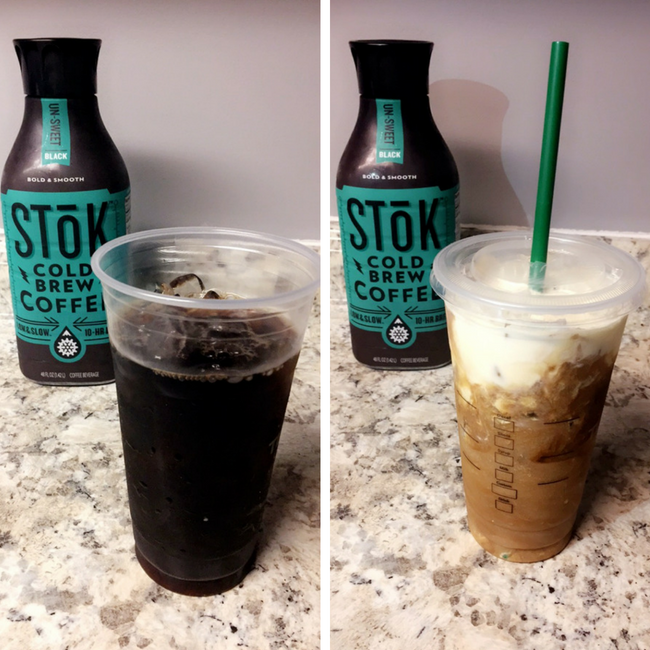 I personally like to use the Stok Cold Brew Coffee because it’s delicious and convenient for this busy mom. Stok Cold Brew Coffee is brewed low and slow for around 10-hours. I get the un-sweet kind with no cream and no sugar. That way I can add things to it that are keto-approved. This Keto Iced Coffee is delicious, easy to make, and very refreshing on a hot summer day. It makes a great afternoon pick-me-up when you’re following a Ketogenic Diet. oil and slightly mix with a spoon. Add the heavy whipping cream and fill to the top. *The monk fruit extract I use is from Latanko. You can use liquid stevia drops or stevia powder. Any keto-friendly sweeteners will do! Depending on how you enjoy your coffee, you can add 1 tsp, more or less. I like mine on the sweeter side. Do you drink your coffee hot or iced? If you are following a ketogenic diet or would like more information about it, let me know in the comments below!